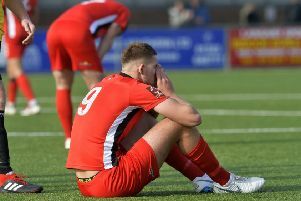 Yesterday’s 2-1 home loss against relegation rivals Gloucester sees Borough without a win in 13 matches and leaves them with serious work to do if they are to avoid the drop. With four matches remaining, Borough are 17th on 38 points just two above third from bottom Truro. Gloucester also have 38 points, while fourth-bottom Hungerford are 37. East Thurrock are second-bottom, while Weston-super-Mare are bottom on 28. After a scrappy first half Charlie Walker gave Borough the lead on 50 minutes before Noel-Williams levelled for the visitors. Gloucester landed a late hammer-blow as Jackson netted the winner on 90 minutes. 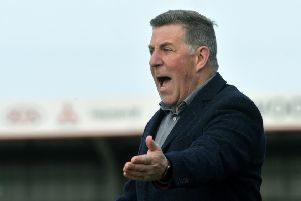 Mark McGhee’s team travel to leaders Torquay nest Saturday. They then welcome Dartford to the Lane before. Slough away and Concord Rangers at home make up the final two fixtures. Speaking after the match, Charlie Walker said, “We are doing everything we can to get the win. The first half was scrappy, it was never going to be pretty. Second half we started well and we got the goal. “But when we are in this position, things go against you. We have just got to stick together. We are in a tough fight for our last few games.